The unique bright chrome-yellow bill with a black saddle mark and tip should make identification of Yellow-billed Duck easy. They do not need to taxi on the water and take-off is usually direct. Only in the air the flight is normally high, fast and strong with a rhythmic wingbeat. The metallic green or blue speculum with narrow white borders further assists in identifying them. 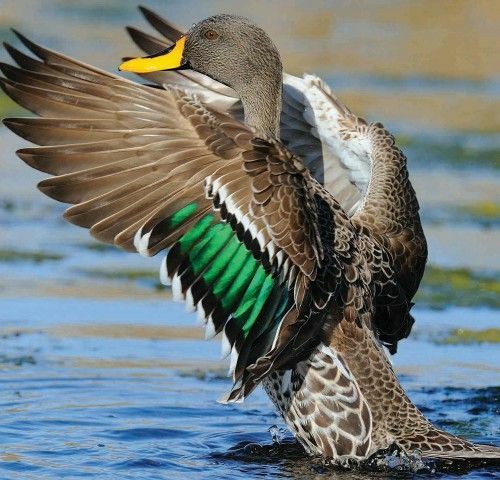 Yellow-billed Duck are widespread throughout South Africa except for the waterless desert areas. The frequent both natural and artificial water especially dams, vleis, pans, rivers and sewage works, usually with some form of marginal vegetation. During winter months, they often congregate in large numbers on these water where, for much of the day, activity is minimal. They are largely nocturnal feeders but can be seen during the day dabbling in the shallows for aquatic plants and insects. Yellow-billed Duck often fly out in the early evening to cultivated lands to feed on grain such as maize and sunflower or green fodder.